Princess Belle, embellished in haute couture! The stunning statue stands 7 3/4-inches tall. From Beauty and the Beast and Enesco's Disney Couture de Force collection. Enesco's stunning Disney Couture de Force collection showcases Disney's reigning princesses and vampy villains embellished in haute couture. 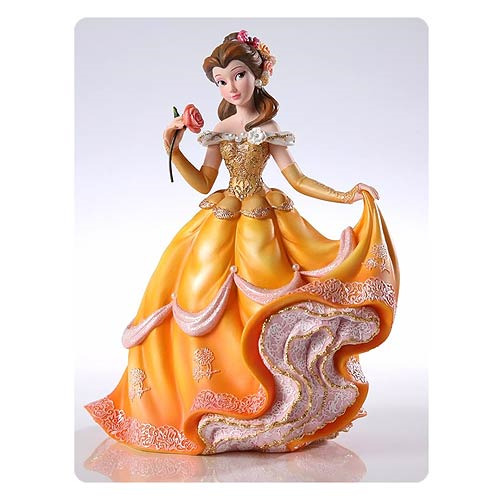 In this sensational Disney Showcase Beauty and the Beast Belle Couture de Force Statue, Princess Belle stands 7 3/4-inches tall x 6 1/4-inches long x 4 1/4-inches wide. She's made of stone resin, with no detail overlooked, from her faux jewels to the opalescent paints that bring the Beauty and the Beast sculpture to life. Ages 13 and up.